I'm wondering if pickled eggs is a British thing, I love them and so does my eldest daughter, Chris is more of a curried egg fan. I set to and made a big jar of them tonight after dinner, now to wait 6 weeks before I can eat them. Do you make your own pickles? if so what do you make? I admit, I don´t anymore after all the kids have moved out, as hubby doesn´t enjoy such things, so just to make it for me is too much work, that I don´t bother then, but I must admit, I just LOOOOOVE to eat it he he he. You will not believe this but it's the truth.. I just went to the computer to look up a pickled egg recipe and noticed your post. Kevin and Adrienne ate deviled pickled eggs and I was going to pickle the eggs for them to get started. He loves pickled eggs but I don't eat them. Enjoy and I'll let you know how mine turn out too. Hi never made pickled eggs but I do make pickles and have made different chutneys, relishes , the odd jam usually with chilli , chilli and strawberry is my favourite but is my great grandmas piccalli definitely so much better than bought and so easy to eat by the spoonful. Everyone who tries it says I should patent the recipe and sell it but I think for now I'll just keep it as a secret family recipe. Hi Jak, not sure if its a British thing or not. I see them here, in the Southeast of NC (USA). Of course, many of us are of English descent. I see all sorts of things pickled, such as watermelon rind, chiles, chutney, pigs feet, etc. I really like bread and butter (sweet and sour) pickles the best. Here in Germany we know "Soleier". We give the eggs in salted water for a few days... or one week. You also can add spices. I love them for easter, but in many german pubs you can have them... specially in Berlin. Wow, six weeks! Overnight and they should be mighty tasty! I'm from Pennsylvania (USA) - We love pickled eggs but make them a little different. We pickle them with red beets so the eggs turn out purple. The may still taste similar to yours?? I make mine up at least a week (or 2) ahead of time so the are purple through to the yolk. Yum! I haven't tried pickled eggs but I do make my own tomato chutney. I don't think I've seen them in pubs for years. I used to make these for my son. Of my 3 children and the rest of the family, he and I were the only people to enjoy them. I made them exactly as Lisa (above ) does. I also love all things beets. I only recently began enjoying fresh beets...I didn't know what I was missing. They can be pickled also. I am wondering if you are refrigerating them, or have they undergone a canning process, so it is not necessary. HI Jak, I'm from Tennessee, we do pickled eggs. Mine have about 4 more weeks to go. Sometimes I just use the juice from and good store bought pickle and add them to it or make them up from scratch. 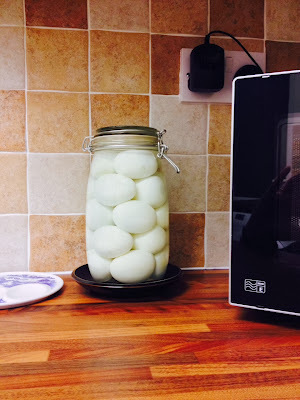 I love pickled eggs but have never made my own. I usually have one when I have roe and chips from the fish shop.